Passion and fashion collide for the ultimate ladies night out experience. Grab your bestie and prepare for an evening of lotions, potions and things that buzz in the night. 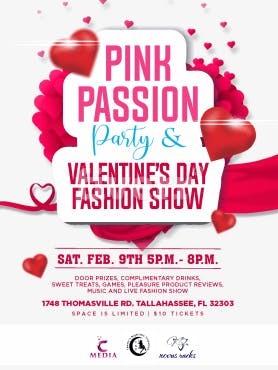 Plus, a live fashion show featuring the latest in lingerie from Tammy’s Nighttime Treasures and the perfect date night dresses by Novus Racks. All featured products will also be available for purchase just in time for you to set the mood for love this Valentines Day. Drinks and tasty nibbles included. The first 5 guest will receive a gift bag.